Early arrival option: Welcome to Trinidad! Optional early arrival in Port of Spain, the thriving capital of Trinidad, and our home for the next two nights. We will enjoy a chill evening, having a Shabbat dinner with members of the tiny Jewish community, and learning about the history of Jews in Trinidad. In the evening Independence Square is full of locals liming - hanging around, chatting to their friends and sampling food from the stalls scattered throughout. Wandering through here is a great way to get a feel for what Trinidad is about! We will also be meeting our amazing guide for the week, Courtney Rooks of Paria Springs Tours- Mr. Trinidad Eco-Tourism himself! For those who have arrived early in Trinidad you can head off on the Covigne River Gorge Adventure, on Trinidad's north western peninsula, where a gorgeous river hike awaits with a gorge and cascades to climb and swim in. Tonight we meet the local Jewish community for dinner and continue with a fun night of 'liming' (having a good time in Trini) on the town - along the famous Ariapita Avenue, with its restaurants and nightlife. Rest of group - Arrive today transfer to Port of Spain, joining rest of group tonight for our outing in Port of Spain. We start our adventure in Central Trinidad to explore the mainly Indian (Hindu)aspects of the islands history visiting the largest Hanuman (god in Monkey image) temple in the western hemisphere and the Waterloo Hindu temple in the sea. Built when the South Asians were not permitted to build on cane land, this temple is on the water and is reached by a pedestrian causeway. After a delicious curry lunch this afternoon we will go kayaking through the lush interior of Caroni Wetlands, looking for tree boas and the spectacular Scarlet Ibis! Tonight is a night of Steel Pan (Steel Drums) in the streets of Port of Spain, with local food, drinks, and a 'lime'! We are off to Tobago! Early Breakfast and transfer to airport for Tobago flight. The 20 minute flight takes us to Trinidad's sister Isle, Tobago, the quintessential Caribbean Island! Optional SCUBA Diving: Those who wish take an early flight to Tobago, head to Cocoa Reef Hotel which is very close and head out for SCUBA Diving with Undersea Tobago. You will spend the morning doing two dives on amazing reefs. Snorkeling: On our way to Pigeon Point we stop off at Mt Irvine and go for a snorkel. In between Staghorn, Brain corals and Sea fans we amaze at the beautiful colours of parrot fish, angel fish, damsel fish, moray eels and so much more in enough colours to make a rainbow blush. Stand Up Paddle (SUP): Pigeon Point is a white sand beach on a point that is protected by the Buccoo Reef, Trinidad and Tobago's largest reef, which is a barrier reef of world fame. The point is famed for a place to relax but more to our liking it is famous for kite and wind surfing and now Stand Up Paddling. For those of you who skipped the SUP in Trinidad will get lessons in basic SUP handling. For those more experienced can go paddle in the Buccoo Swamp and / or surf some waves. Bioluminescence Tour: After the SUP tour we wash off, relax and grab a dinner to go, eating on the beach. Then it's back to the SUPs for a night of paddling. Why night you ask? Well we paddle to the mangroves to see tiny angles! That is the bioluminescence as it lights up our paths, paddles and anything that moves through the water. After this we head to Footprints Eco Resort in Culloden Bay, which is about a 40 minute drive. After check in, we will eat an amazging organic dinner and chill to the gentle sounds of the surf. After a wonderful Morning yoga and a healthy and filling breakfast we head up Tobago's rugged and stunning Caribbean Coast to Charlottesville, Tobago's northern most town. The bay is a large steep walled, scenic fishing community with azure seas and stunning reefs. Those who wish climb aboard their SUPs and paddle out to Loves Bay, an aptly named beach that exudes paradise. Those who wish follow in a local fishing boat. The day is full of snorkeling through kaleidoscopic reefs, idyllic beaches and fun adventure. Back at Footprints dinner is delicious and sleep is deep. We start at the Top of Tobago walk back in time into the heart of the rainforests. This ancient yet modern ecosystem sets the entire week into place, time and theme both with how the ecosystem evolved and its impacts on everything. Also this the conservation of this rainforest was possibly mankind's first legal act of conservation. Lunch is on the beach at Parlatuvier, a beautiful fishing village. After a relax we enter the sea, snorkeling gear is donned and we dance among the Angels, horses and damsels... Sea life abounds as we search for my favorite, the Queen Anglefish, whom many believe to be the world's most beautiful fish. Today we head to the airport for the 20 minute flight to Trinidad, and our ride to Grande Riviere, a rural village situated on the north coast of Trinidad. The drive is long so we break up with easy walk to rivers for swimming, splashing and exploring. 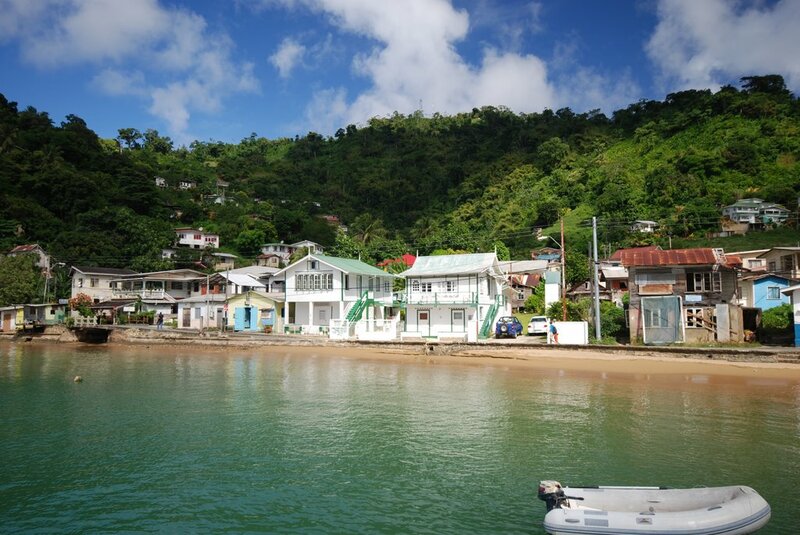 Grande Riviere gets its name from the large river which runs through it, meeting the sea. For bathers, this allows the opportunity to combine sea bathing with river swimming in the same location. Trinidad is now likely the world’s leading tourist destination for people to see leatherback turtles, the worlds largest, mainly due to conservation efforts of the past few decades. The number of leatherbacks on this tropical beach has rebounded in spectacular fashion, with some 500 females nesting each night during the peak season in May and June, along the 800-meter-long (875-yard) beach. In September the hatchlings start emerging, and tonight we will not need to venture far to look for tiny living dinosaurs emerging from the sand on their way to the great ocean! Our journey moves to Trinidad's Northern Range. We start the hike in old cocoa plantation walking along wide jeep trail and then onto mountain trail into secondary forest growth, then rain forests. Soon we descend into the Guanapo River where we will be walking / wading / swimming up the river until we make our last steps to the entrance of the gorge and we enter by swimming the first of many emerald pools! In the gorge we walk, climb and swim our way through, getting very wet having lots of fun as the river cascades about us. Our drive ends at Pax Guest House, our home in the hills. Today we head to the center of Trinidad to Tamana, which houses a set of caves that are home to twelve different species of bats and has an estimated population of 1.5 million bats. It is the second largest in the Caribbean, and truly a once in a life time experience! The highlight of our expedition will be to witness at dusk, the migration of bats leaving the cave in a spiral formation. This spectacular event, which can last for several hours, seems never ending as thousands of bats exit in search of food! We will end the day with a celebratory dinner in Port of Spain! Time to say goodbye! We will leave our hotel and head to the POS airport, holding on to memories and new friends - with a promise of returning to these islands of paradise! Our Trinidad & Tobago adventure will take place from Saturday, May 23 to Sunday,May 31, 2015 (8 nights in total; 9 nights for those wishing to arrive on Friday). We will be meeting at and leaving from the Port of Spain (the capital) international airport (POS). We ask that you plan to be on a flight that will land in Port of Spain by 7 pm on May 23. If you decide to arrive a day earlier (Friday, May 22), please plan on landing by 4 pm. Your flight home on May 31 can be at any time during the day, though most attendees prefer the early morning departure. As noted, you have an option of arriving on Friday and spending the first weekend in Port of Spain, meeting with the tiny Jewish community and spending some time getting to know the Trini culture. If you want to arrive a day or two earlier, or choose to leave later, please let us know how we can help you experience more of this magnificent island. 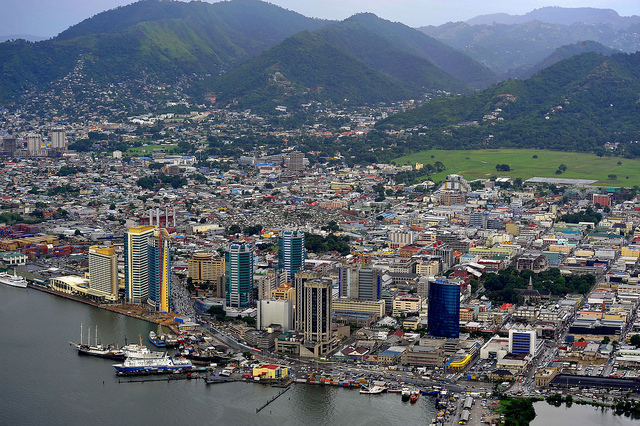 We can arrange for a pick-up or drop-off in another part of Port of Spain at the beginning or end of the trip. Near Port of Spain, you will stay in the Pax Guesthouse, a unique building that once housed a Benedictine Monastery. On the northern coast of Trinidad, you will be staying in the magnificently situated Le Grande Almandier eco-lodge, right by the beach. On Tobago you will be staying in the secluded Footprints eco-resort. Our Trinidad & Tobago adventure will be guided and led by Mr. Courtney Rooks, a local naturalist and tour guide, whose vision and energy is the driving force behind Paria Springs Tours. Courtney is an amazing guide, and he will be introducing us, with his unique sense of humor, to the people and nature of the islands. You can read more about Courtney at this article from the Adventure Travel site. Ami Greener, director and founder of Greener Travel, will also be accompanying this trip. We provide all land, marine and transfers during the week using an air conditioned van or minibus. All meals during are included in price of the trip.